We had a chance to chat with Donald Tofias, developer of the W-Class yachts, during the Loro Piana Caribbean Superyacht Regatta & Rendezvous in Virgin Gorda recently. Here's the next project, the cold moulded W-100. She's got long overhangs and an LOA of 30.51m, max beam of 6.25m and a fixed draft of 3.96m. Total sail area with 100% fore triangle is just under 465sqm. Nice ballast to displacement ratio (55K:169.9K) so I expect her to be stiff and lively as well as pretty! The plans are to ABS and will also comply with ISAF special regulations for offshore racing. She's designed by Bruce Johnson and Rockport Marine, with engineering by Persak & Wurmfeld. 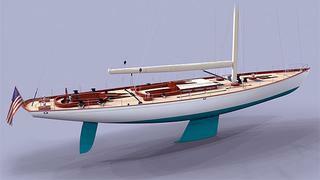 The interesting part of the concept is that she can be built to race now, with pipe berths forward for her regatta crew, and fitted with a three stateroom cruising interior utilizing the same bulkheads later. Either way all the tankage and machinery is in place as are the galley and the permanent crew quarters aft. Martha Coolidge is the interior designer. Ready to be built in Maine and assembled at Front Street Shipyard, the first W-100 is now waiting for an owner. Some of the components will be built in conjunction with the yard's neighbouring partners, Brooklin and Rockport as they all work together.